With more and more of life taking place on the internet, it has become imperative to have a web presence if you want to stay relevant in today’s day and age. Whether you are a small business owner that wants to branch out into the digital market, or you are one small piece of a very large enterprise puzzle, getting your information online has never been more important. 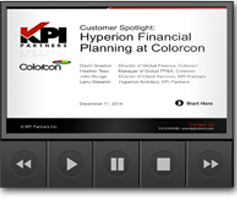 On December 11th, KPI Partners was joined by the Global Finance Team at Colorcon for a customer spotlight webinar which profiled the successes and challenges of the performance management solution at Colorcon. This article addresses the utility of the hybrid-agile delivery model designed to provide for rapid innovation, prototyping and deployment specific to new software product development and innovation.